Announcement ***PROCESSING TIMES HAVE CHANGED*** Orders should be going out closer to 1 week from purchase. If you need something by a certain date please leave me a note and/or choose the priority mail option at check out. Thank you! Custom item requests are always welcomed, if you see something you like but would prefer a different color, size, etc. feel free to contact me. ***PROCESSING TIMES HAVE CHANGED*** Orders should be going out closer to 1 week from purchase. If you need something by a certain date please leave me a note and/or choose the priority mail option at check out. Thank you! Bohemian Dreamcatcher Barefoot Sandals. Hand Crocheted Vegan Friendly Cotton. Festival Beach Wedding Sandals. Gypsy Feet. More Colors! Essential Stripe String Bikini Brazilian Bottoms. 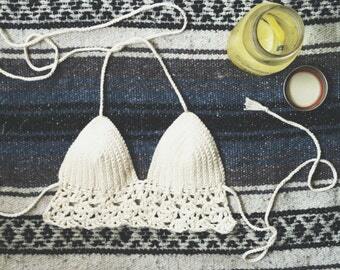 Hand Crocheted Bohemian Swimwear. Vegan Friendly Cotton Crochet Bottoms. More Colors! Cali Brazilian Bikini Bottoms. 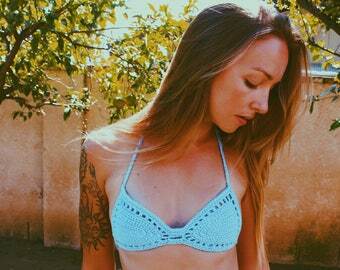 Hand Crocheted Bohemian Swimwear. Vegan Friendly Cotton Crochet Bottoms. More Colors! Lacy Mid Rise Cheeky Bottoms. 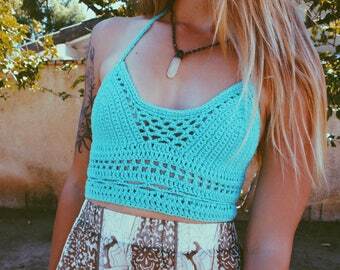 Hand Crocheted Bohemian Swimwear. Vegan Friendly Cotton Crochet Bikini Bottoms. More Colors! Batik Gypsy Feet Bohemian Barefoot Sandals. Hand Crocheted Cotton Soleless Sandals. Vegan Friendly. More Colors! Hand Crocheted Classic Skull Beanie. Vegan Friendly Sugar Skull Beanie. Halloween. More Colors! Stevie shorties that went out last week! Jayblue Handmade started as a creative outlet, but has slowly become my life's passion. When I started Jayblue I was mostly looking for a way to get rid of my excess crochet buildup. Once I got started however, I began to realize my love of sharing my creations with the world around me. There is something so vulnerable about the experience, and yet so rewarding. I am constantly inspired by new things and new people within my life. Jayblue is ever changing and is a testament to that. Every item is handmade, piece by piece in southern California. One of my favorite aspects to the creative process within knitting and crocheting is coming up with my own patterns, everything you see within my gallery can not be seen identically anywhere else, which is part of what makes buying handmade such a special experience. Please feel free to contact me with any questions you may have. Like Jayblue Handmade on Facebook or follow @jaybluehandmade on Instagram to see a more day to day in depth look of my process. Welcome to Jayblue! Every item is handmade with love, I knit and/or crochet each piece myself. You will notice that some items are made to order and completely customizable and some are one of a kind ready made pieces. Explore and feel free to contact me with any questions! If you see something you like but would prefer some alterations in size/style/color custom orders are always welcomed!